The first to be released of Fanstoys Insecticons, FT12T Grenadier is the second bug to crawl across my desk. While he shares a lot of design similarities with Mercenary, there’s plenty to talk about that is unique and he definitely has his own identity as a toy. Bombshell is my favourite of the Insecticon designs so I may be a bit biased towards Grenadier aesthetically. 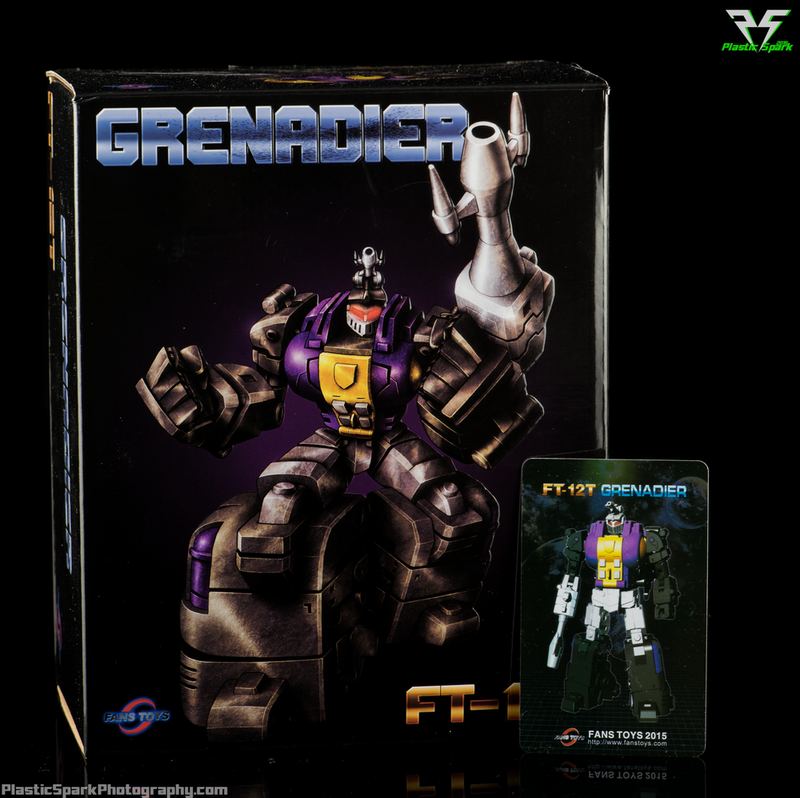 Fanstoys released Grenadier in 2 variants, FT12 and FT12T, The standard release had a grey painted chest to match the G1 cartoon, with the T variant sporting a gloss purple to match the G1 toy paint scheme. The sample lent to me is the purple variant. It's on loan from Blast Off Toys and Urban Pop Shoppe! An awesome local collectables shop located in downtown Calgary! A link to their Facebook page is at the bottom of the article. 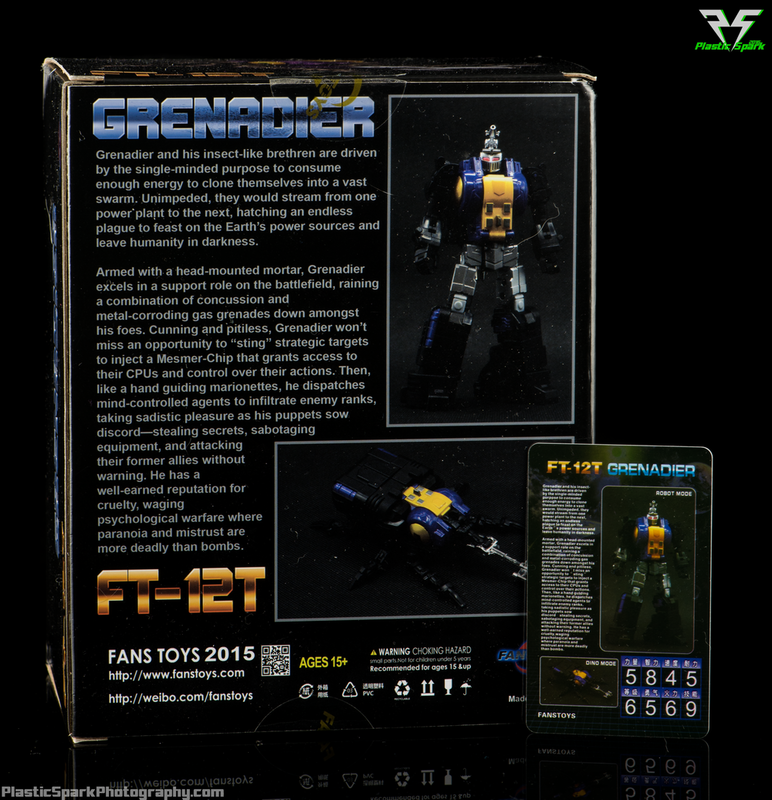 Let’s dig in and check out FT12T Grenadier! Bahaha! I love the smell of burning bots in the morning! Much like Mercenary, Grenadiers alt mode is extremely slavish to the G1 design. He ships with 2 sets of legs, again the same as Mercenary. Honestly there isn’t really anything to different about the alt mode, what you see is what you get. The articulated legs are strong enough to hold up the figure in various poses and his horn is adjustable to whatever angle you prefer. He can store his blaster in the rear as a sort of stinger though I personally don’t much care for it as it looks a bit strange. Yeah... I dunno what else I'm supposed to do with a bug. .There isn’t a ton to do with Grenadier in this mode but he certainly looks the part of a Masterpiece style G1 Bombshell. Grenadier has my favorite robot mode of the three Fanstoys bugs. I absolutely adore everything about the proportions, color scheme, and downright vicious head sculpt. He looks mean, and unforgiving, ready to ruin any Autobot’s day who has the misfortune to stumble upon him. Let’s start up top with the head sculpt. Grenadier homages G1 Bombshell perfectly with blazing red metallic eyes, the signature head cannon and a medieval style faceplate with just the right amount of black paint to bring out the venting details. The head is on a ball joint, however it is slightly limited due to the high collar on either side. He can’t look down very far but if you unclip the chest you can cheat a bit by using the folding base that his head rests on. The gloss purple paint on Grenadier’s chest pops and really adds a nice premium finish to the final product. I have heard some complaint that none of the other bugs have this same purple paint and while I do think it would have been nice to see similar paint applications on the other figures I think they look fine as a set as is. 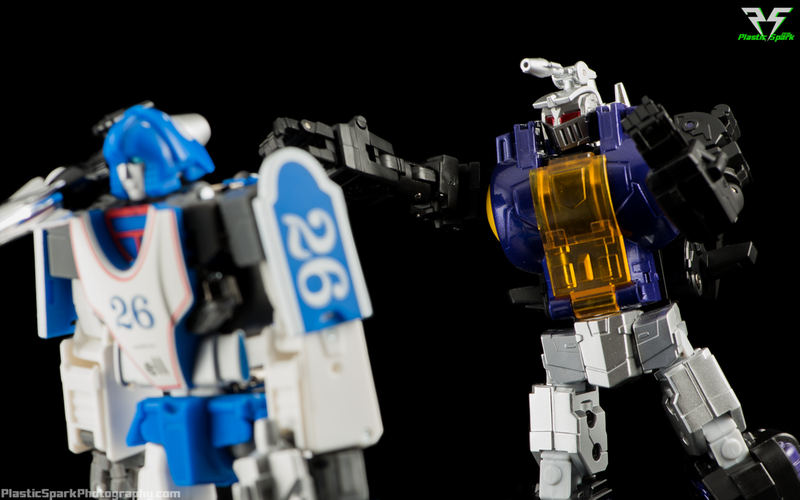 Prepare to die Autobot scum! The arms on Grenadier are pretty much the same as Mercenary. 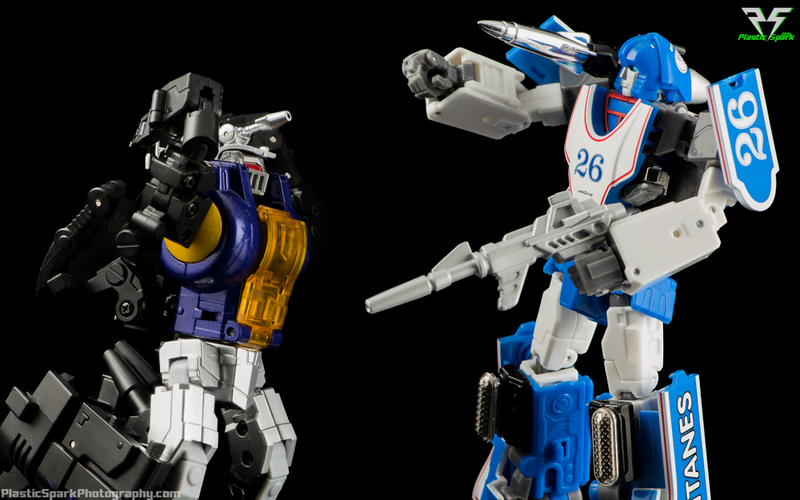 Double jointed shoulders, full rotation, bicep swivel, double elbow and a wrist swivel. Lots of dynamic poses you can pull off and they look good at any angle. 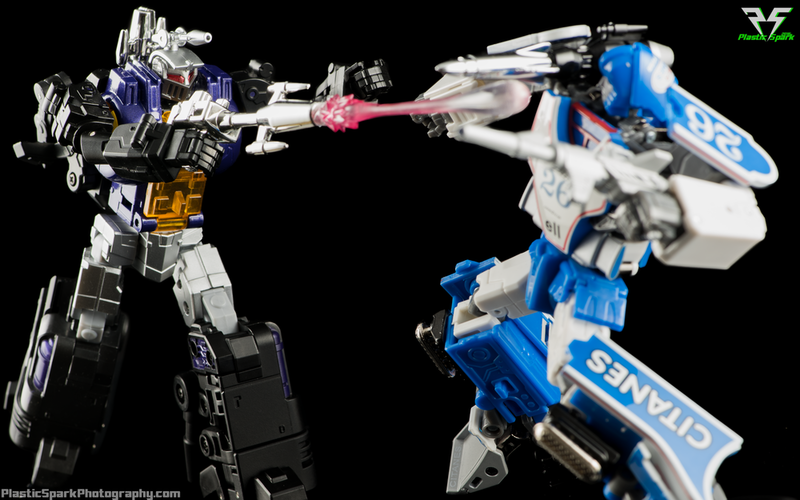 Poses like this would be greatly improved if the waist swivel worked. Grenadier has to have a waist swivel. 100% I am positive he has a waist swivel. But it will not rotate more than 2-3 degrees on this copy! I didn’t want to force it as the toy doesn’t belong to me. It might just need to be disassembled or something but I didn’t mess with it too much. It’s completely locked up. If it worked properly as I imagine almost every other Grenadier does, it would really help to add to walking, running, or shooting poses. Same with this one, although he still looks awesome! He’s got universal hip joints with the usual forward/backwards and outward movement. Double jointed knees and the same impressive inward ankle tilt that Mercenary was rocking. 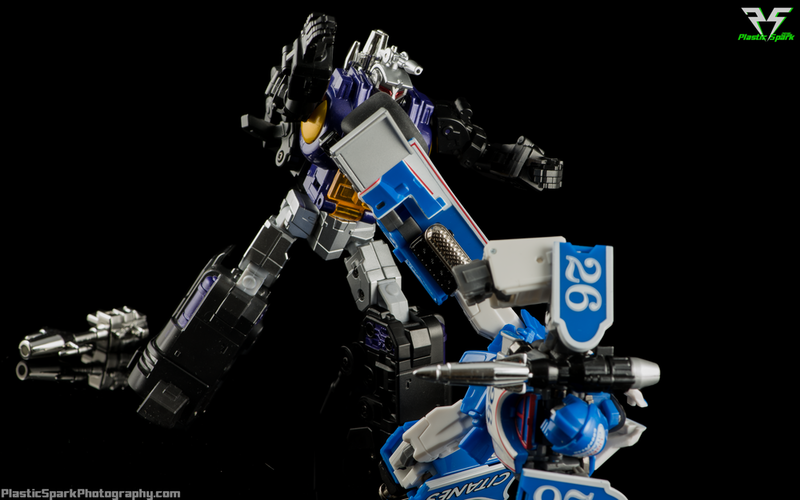 A severe inward ankle tilt is something that I’m starting to get accustomed to on almost all of Fanstoys products that I’ve messed with. I do wish they had a little bit of outward lean as well though to facilitate running poses without falling over. The legs, once revealed add a welcome splash of metallic silver to the color scheme. I think this does a good job of breaking up all the monotonous matte black. Preparing Cerebro Shell for deployment Lord Megatron! These are the same 3 pink, clear plastic cubes that have been included with Spotter, and the other bugs. Not much to talk about here. Small enough to look good with the bugs, not big enough to work with anyone else. Grenadiers blaster looks really cool. It’s fully chromed with the barrel and spikes to match his alt mode beetle horn. I really love the look of this blaster in his hands. He looks ready to demolish anyone foolish enough to get in his way. Feel the sting of my Twin Ion Impulse Blaster! 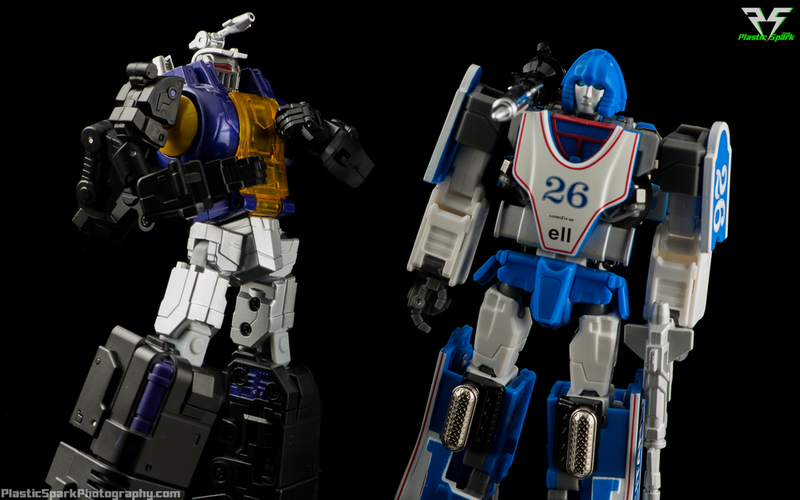 Just like Mercenary, Grenadier comes with a replacement clear amber chest piece to emulate the original G1 toy design. My copy came with this chest preinstalled and I chose not to change it as the toy doesn’t belong to me. Personally I prefer the look of the solid chest pieces. The chest is not actually installed here, I just have it hanging by the top pegs to show what it looks like. Just like Mercenary (sensing a pattern here?) Grenadier comes with replacement bug legs similar to the G1 style on Bombshell. As someone who mainly displays in bot mode I really like the option for simplified legs as they make a less obtrusive backpack. The option for more articulated legs in bug mode is a welcome one that I applaud Fanstoys for including. Not really an accessory but of course the usual magazine style instruction booklet and bio card are included. Due to the size of the boxes for these bugs the booklet is typically folded in half, or at least in a 90 degree bend to fit into the box. 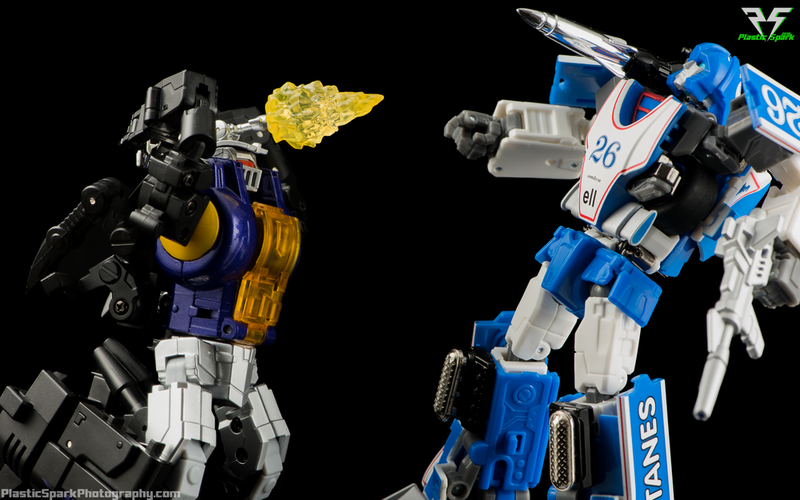 First I'll destroy your body, Then I'll invade your mind Autobot! You will do my bidding! I love this toy. Bombshell is my absolute favorite of the original Insecticons and I think Fanstoys nailed it. There are a couple nitpicks here and there, and a working waist joint would be nice (I’m still sure this is not a widespread problem and just an issue with this particular specimen). I don’t think you can do better for a Masterpiece Bombshell than FT-12T Grenadier! Go get one! What do you think? Leave me a comment below! I would love to hear your thoughts on Fanstoys FT-12T Grenadier!